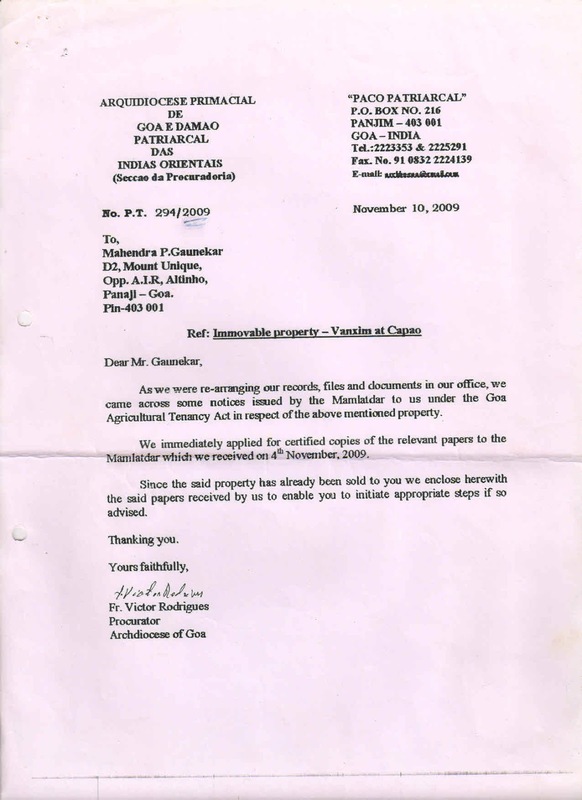 This is a scanned copy of the letter dated November 10, 2009 of the then Procurator of the Archdiocese of Goa in 2009 Fr. Victor Rodrigues writing to Mahendra Gaunekar that Vanxim is sold. This letter was asked by delegation from Ilha de Vanxim Association on December 01, 2010 to be revoked. Archbishop simply said to Fr. Victor Rodrigues "Don't write letters like this next time." 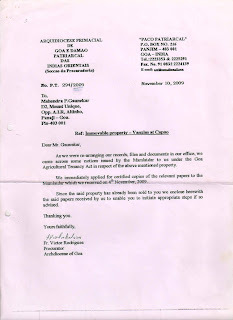 On further insistence by Maggie Silveira to revoke this letter as it serves as basis for cases filed by Mahendra Gaunekar against Tenants in Vanxim, Archbishop Ferrao flatly refused and said it is too late. Also note the address of Mahendra Gaunekar that was hidden in Agreement to Sale as well as in Sale Deed. His address is : D2, Mount Unique, Opp. A.I.R, Altinho, Panaji - Goa. Pin - 403 001. This letter also is a symbol of arrogance and corruption at the highest level in the Archdiocese of Goa, and since it has remained unshackled it is spreading like a cancer far and wide gradually but certainly. Bishop's house has been turned into house of Business; selling land all over. Vanxim is just one example. Situation is truly challenging and we need all your good wishes and prayers for solution to arrive for turning Vanxim back into fertile agriculture. Together we will make it! Ozone claims it owns 141 acres of Vanxim land!